OUR REVOLVING BOOK TUESDAY EDITION IS BY MINNETTE MEADOR! NIGHTOWL ROMANCE – I encourage you to try out Minnette’s work and see how enmeshed you will become in her wonderful settings. COFFEE TIME ROMANCE – Ms. Meador weaves a beautiful story that I could not get enough of. Her characters are so full of life and were enjoyable to read. Somewhere between thirty and dust…red hair, blue eyes…six kids, one slightly used husband, and any number of pets from time to time… wannabe hippy… wanttheirmoney yuppie…pro musician and actress for 20 years… native Oregonian… lover of music, beauty, and all things green. Willing slave to the venerable muse. Minnette currently resides in Portland, Oregon with her husband, having replaced the children with one dog. The dog, Pierre, pretty much runs the show. Tequelin appeared in a mist, naked, except for delicate wristbands of gold. His hair was loose now, untamed, wild, a glowing snowstorm around that strange haunting face. A light illuminated his eyes, blue diamonds circling black luminous pools. Deeply muscled, strength radiated from every inch of his pale skin. Cringing on the ground, she tried to crawl away. An arm caught her around the waist, drew her from the floor and hauled her against a massive chest. The beat of his heart vibrated against her shoulder. Long white fingers closed around her throat, almost meeting at the back. He pulled her face back to meet his gaze. Squeezing her eyes shut she struggled, digging her fingernails into the flesh of his forearm. The skin hardened into rock. “See me.” The whispered words spun through the room. Belle had no strength to fight. She opened her eyes. Tequelin stared down into her soul, his mouth opened softly, bending down to steal a kiss. When his lips touched hers, everything changed. Passion flamed between her legs, drenching her. It spread through her skin like wild fire. The hard knot shoved into her back made her weak with need. 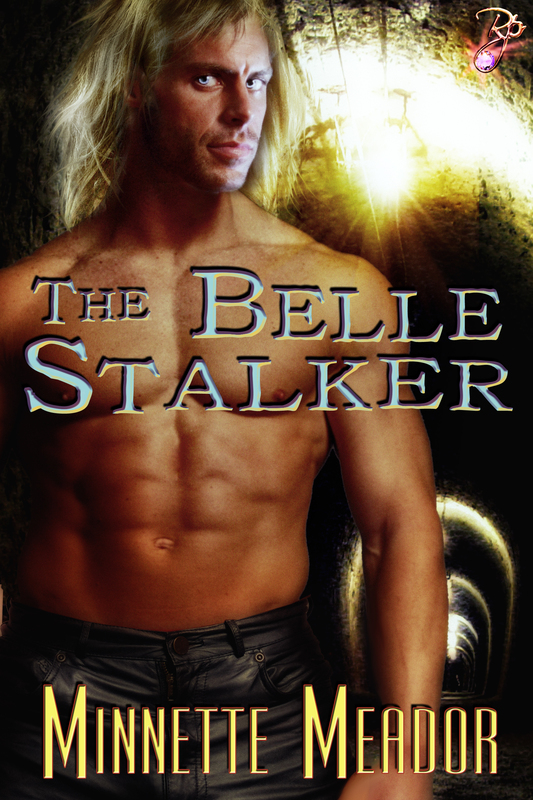 In a glint of revulsion, Belle knew her body would betray her under Tequelin’s touch. She had to stop it. Now. Quickly. “Still,” he whispered against her lips, and she froze in place, tremulous whimpers vibrating in her chest. The fingers left her throat.